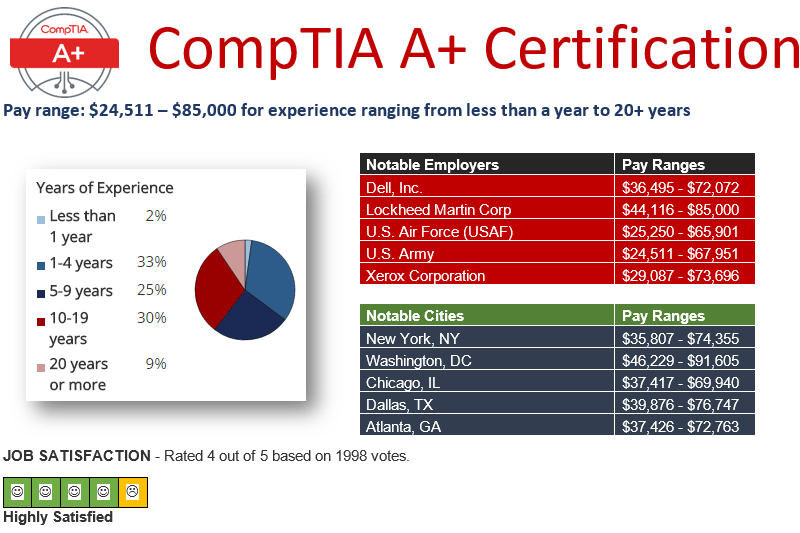 There is one article for each A+ 220-901 Exam Sub-Objective as defined by CompTIA. If this was a book these articles would together represent a 200+ page book of very concentrated and focused A+ test preparation. Click the link for the ExamNotes for A+ 220-902. We recommend you use these ExamNotes in conjunction with our CertBlaster A+ practice test. At the end of each CertBlaster exam (taken in Assessment or Certification Modes) you will receive a custom Personal Testing Plan (PTP) that based on your answers will list, by A+ Sub-objectives, all the areas that have been identified as your weaker areas. These are the ones you need to focus on in your A+ exam preparation. If you go down your custom PTP and just select the ExamNotes that pertain to you as per that PTP, you will now have a very efficient exam prep tool in your hands. Good luck on your quest for A+ certification! Below is a montage we did for A+ certified individuals. Data based on PayScale Inc. June 2016 numbers.